The main focus of downsizing has shifted from the private to the public sector. The cutbacks began in the Department of Defense. Now the goal is a federal civilian workforce reduction of 12 percent by the year 2000. This pioneering study looks at the management of workforce reductions in the public sector both in theory and in practice. Three case studies -- of the Defense Logistics Agency, the Bureau of Reclamation, and the Food and Drug Administration -- illustrate the organizational, managerial, and human dimensions of attempting to improve performance with reduced resources. The author draws on extensive interviews with senior executives and middle managers in the three agencies; at the General Accounting Office, the Office of Personnel Management, and the National Performance Review; the Senior Executives Association and the Federal Managers Association; and scholars and researchers. In a larger sense, this work pushes the boundaries of knowledge concerning organizational change and makes a significant contribution to organization theory. 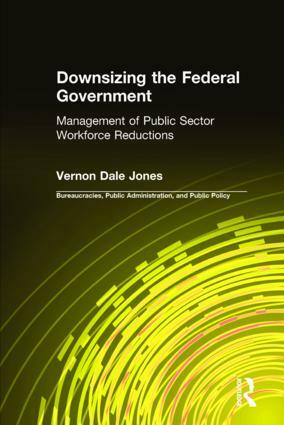 It offers important new insights not only for public sector managers but for organization theorists and management specialists whose work on downsizing has been presumed but not shown to be applicable to the public sector.